"The project involved a complete facility management, including all HVAC plant and terminal controls, lighting, access control, video, fire alarming monitoring, energy metering and reporting employing LonWorks, Modbus, BACnet, and SMTP protocols through HTTP," said Roland Gutknecht, Director of Customer Service at Environmental Systems of Chicago. "After reviewing all the options, the customer decided on the Niagara Framework to monitor and control the system via BACnet over IP for the devices and systems. The framework is 100% open; a requirement that had to be met. In addition, more than 80% of the building's motors were replaced as well as converting to variable-frequency drives (VFDs). This enabled a huge energy savings." Gutknecht said that the cooling and heating systems were updated which resulted in more energy conservation. These systems were joined into the BAS so engineers can make any essential repairs in case of an alarm. In addition to e-mail alarming, Environmental Systems of Chicago implemented automatic fault detection & diagnostic rules to notify engineers of a deteriorating or energy wasting mode of operation for their central plant equipment. "The Contemporary Controls' Skorpion switches made the difference," said Gutknecht. "Our original switches did not support cascading and there were many missed messages and packet losses. The Skorpion switches support cascading, but more importantly, Contemporary Controls' technical support team tested our network architecture in their labs before deployment to ensure these devices would work." Both the compact and low-cost EISK5-100T and the EISK8-100T were employed in this application. Using switching technology, the Skorpion 5 provides five 10/100 Mbps shielded RJ-45 ports and the Skorpion 8 provides eight such ports. 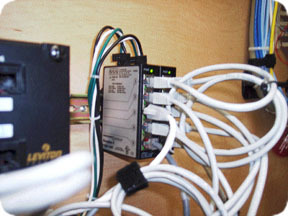 Each port supports the auto-negotiation protocol to select data rate, duplex and flow control. These switches address a major concern and that is convenient mounting in control panels where DIN-rail space is at a premium. Gutknecht commented that these switches met specified needs including reliability, ease of mounting and accessing, no wall wart power supply, low-voltage AC power (8-24V) and UL 508A. All the systems including the BAS were centralized in this building's engineering room so every facet of security, fire or video could be monitored by one operator. In case of an emergency, the operator could shut down an entire system, effectively securing the building. In the opinion of the customer and Gutknecht, the project was a success because of valued team players like Contemporary Controls. "We could have purchased another product," Gutknecht said, "but the support that we were given during this process made the difference."